A waterproof fabric that moves sweat away from the body was developed by bioengineers at the University of California, Davis. The material forms sweat into droplets that can be drained away. "We intentionally did not use any fancy microfabrication techniques so it is compatible with the textile manufacturing process and very easy to scale up," said Xing, lead graduate student on the project. It's not just that the threads conduct water through capillary action. The water-repellent properties of the surrounding fabric also help drive water down the channels. 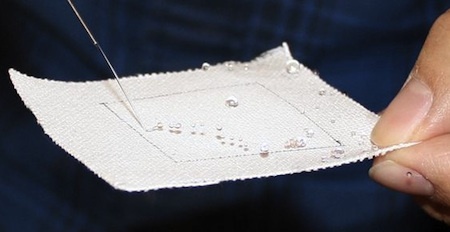 Unlike conventional fabrics, the water-pumping effect keeps working even when the water-conducting fibers are completely saturated, because of the sustaining pressure gradient generated by the surface tension of droplets. The rest of the fabric stays completely dry and breathable. This material would be a perfect choice for the stillsuit from Frank Herbert's classic 1965 novel Dune. From Science Daily; thanks to Winchell Chung (aka @nyrath) for the tip.